Screen shot of Instagram on iPhone. 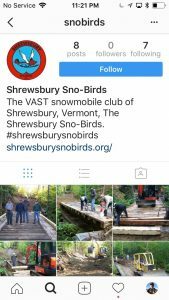 The Shrewsbury Sno-Birds now have an Instagram account @snobirds. We would love to find a volunteer who knows Instagram to manage it (send us an email if you are interested!) Right now you can add your photos to our new Instagram #shrewsburysnobirds hashtag page right here on this site. It works because Instagram posts with the #shrewsburysnobirds hashtag are linked to that page. 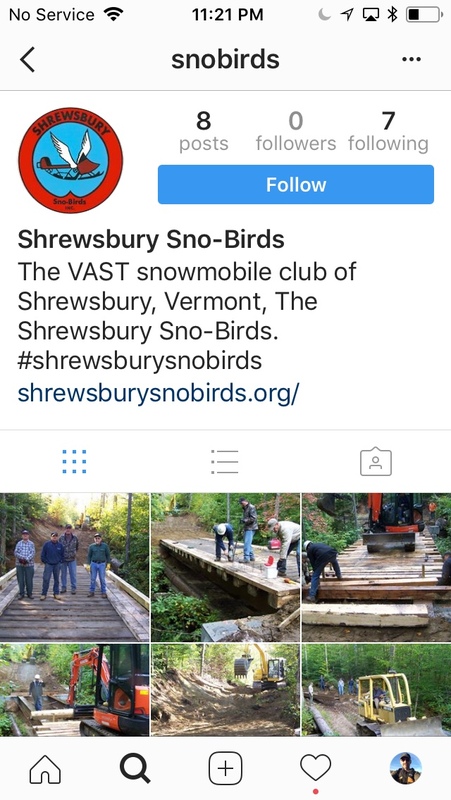 If you find yourself posting a snowmobile pic on your Instagram account, just add our hashtag: #shrewsburysnobirds and it will appear on our linked page. It’s the same if you are looking at a friend’s Instagram photos and see one of the Stone House you can add your own comment with #shrewsburysnobirds and the photo will show up on our page. You can access that page anytime via the Photo Sharing button in our navigation bar. Instagram is made for mobile devices so if you are viewing Instagram on your computer you can’t upload photos from there even if you login. Instead you must download the free app to your mobile phone and login with your credentials there. It is about the easiest social media sign up you’ll ever see so if you haven’t signed up yet, rest assured, it is a piece of cake. Okay, I’ll let you in on a clever work-around to upload from your computer. Check out this page and happy Instagraming!